The trio made their way the long way around the edges of the ravine, moving toward what used to be the Lakes Plaza, where most of the university’s old classroom buildings were now in various stages of ruin. J.T. kept looking at Carolyn, trying to mask his concern. Her jaw had a hard, determined set as they moved, but her eyes were worried. Drew looked as grim as she did, and J.T. got the sick feeling that both of them had more of an idea what was going on around them than he did. That didn’t sit very well with him, especially since he’d been the quietly self-declared protector of most of their female friends for the past four years. The loop took them around, past the place where Thom and Rory were gridding the walls and the shelters. J.T. waved and Thom waved back, then turned back to his work. At least he and Marin had quit fighting for the time being. That freed J.T. up to worry about other things and other people—people like Carolyn and whatever she was starting to see. That worried him more than he’d have worried about anyone or anything else, though he imagined that if it had been Jacqueline, he’d have been pretty concerned, too. It wasn’t that he didn’t think that Carolyn could handle it—whatever it was—because he knew she could. He was just worried. They rounded the ruins of Mackinac, heading toward the hilly lawns in front of the clock tower, where they would maybe expand their little village someday in the future, if they survived that long and had the need to do so. J.T. kept stealing glances at Carolyn, paying more attention to her than their surroundings. She stopped abruptly as they rounded a pile of rubble that had once been the registrar’s building. He and Drew kept going a few more steps before her voice stopped them. “What?” J.T. blinked, staring at her for a moment. Briefly, he saw a small figure on her shoulder, cloaked in a blue-green light, then it was gone and he was following her gaze toward the heart of campus, where the clock tower had once stood. “Is it…is it standing straight again?” Drew squinted at the spire, brow furrowing. It was hard to tell without much frame of reference, but it certainly looked like the tower had trued up since the last time any of them had come this way. J.T. barely stopped himself from taking her hand. Instead, he fell into step with her, Drew flanking her on the other side. Something flickered in Drew’s eyes as they made their way between collapsed buildings and skirted the boggy ground surrounding what used to be a retention pond. The library was still standing, though most of the glass was gone. Their shoes crunched on that shattered glass as they moved through the library’s shadow, passing out of it well within sight of the half-collapsed Lake Superior Hall and the hedgerows that bounded the Shakespeare garden. The building had collapsed away from the garden—more toward the PAC and the mass trench graves they’d dug to bury the dead they’d found—and so the Shakespeare garden should’ve been more or less intact. They slipped between hedgerows and into the garden proper to find the tiny gazebo at the far side blasted to kindling. Half of the plants, from the carefully tended wildflowers to a bed of roses, were torn up, dirt and roots and shredded greenery littering the ground. The stone bench that sat at the center of the garden was broken into three pieces, and the birdbath had been dashed to pieces along the flagstone path into the garden. Tendrils of ivy waved in the breeze, tattered as if some kind of wild animal had taken claws to it. Carolyn gave a little gasp, her hands going to her mouth as she slowly made a circuit of the small garden, once so lovely and peaceful, now so utterly destroyed. Shock and horror marked her face as she moved around, crouching here and there to brush her fingers along broken stones and trampled flowers. J.T.’s heart rose into his throat as he watched her move around, even as the hairs stirred at the back of his neck. Something didn’t feel right here, and a glance toward Drew confirmed that the other man had come to the same conclusion. “This wasn’t wild animals,” Drew said quietly. J.T. shook his head mutely, drifting toward the edge of the garden nearest to the PAC. There was something out there, something he couldn’t quite see, shadows and light playing over the turned earth that had once been a lawn. He suppressed a shudder. Some of them looked like they had faces, and the more he looked, the more he thought that they looked sad. “Oh,” Carolyn sighed after a moment. J.T. tore his gaze away from the shadows, looking toward where she knelt next to the shattered remnants of the gazebo. “What is it?” He asked quietly, stepping away from the hedgerow. “Look,” she said softly, holding a trailing bit of ivy away from the flagstones. She looked up at him and smiled bleakly, and he had to smile back. 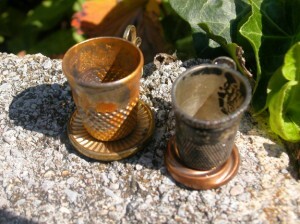 Sitting beneath the ivy, somehow sheltered from the destruction of the garden, sat two tiny cups made of thimbles and bits of old clip-on earrings, laid out as if its tiny owners were ready to sit down to tea. They sat there, ready and waiting, for their owners to return. They were a small bit of simple magic amidst the ruin, the most powerful magic in the world. Thanks again to dawnthreader on Etsy for the use of her product photograph.